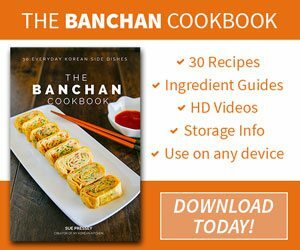 Learn about popular Korean banana milk and make it at home following my easy banana milk recipe! When I was a child, I went nuts about banana milk. I definitely was one of those kids who didn’t like the regular “white milk”. But I could drink any flavored milk, particularly banana milk, non-stop. 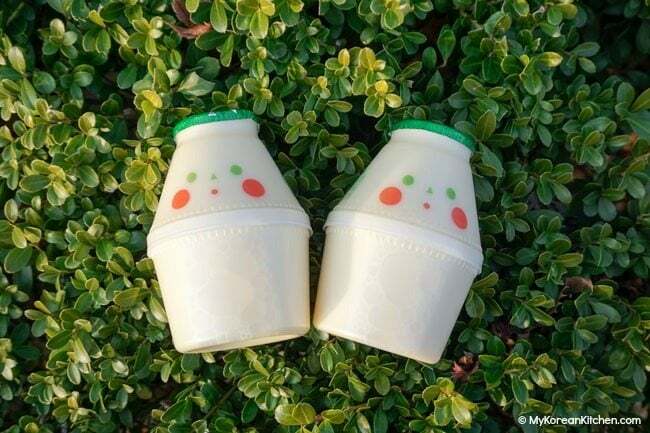 I also particularly loved the banana milk container, which resembles Korean earthenware – hangari, where you store gochujang and kimchi etc. It was just perfect for my little hands to grip. I felt richer when I was holding on to it! Lol. Anyway, Korean banana milk has been around for more than 40 years now. And, if you’re an avid K-pop fan, I’m sure you’ve seen Korean idols drink it on TV a lot. So what’s the deal? Here goes. What is Korean Banana Milk? In essence, Korean banana milk (banana uyu, 바나나 우유) is banana flavored milk. It was first introduced in 1974 by Binggrae and it’s been a steady seller ever since. Binggrae banana milk contains 85% milk, purified water, sugar, 0.32% banana juice concentrate, carotene, artificial flavors – banana and vanilla. This composition may differ if it is made for export as each countries customs regulations are different. Also, they may have to be adapted for international shipping. What does Korean Banana Milk Taste Like? Like banana? Duh! But you may also taste a subtle vanilla taste too. Check your local Korean grocers! You might be able to find it if you’re very lucky. Not all Korean grocers sell this. Even I couldn’t get it! 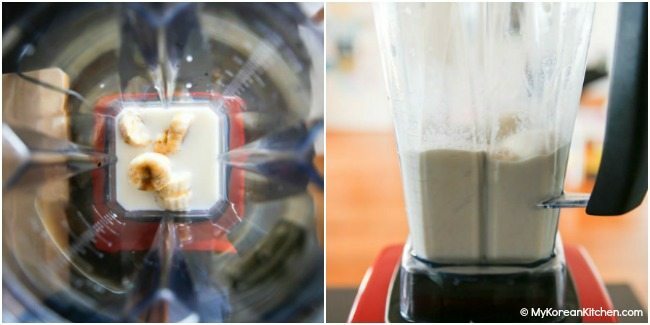 Combine all ingredients in a blender and blend until smooth and has milk like consistency. Serve immediately. It is best to consume the milk immediately as you will notice the separation and discoloration as time goes by. But if you must store it for later, refrigeration for up to 2 days is OK. Just shake the milk very well before you drink it. To go dairy free, replace 1/2 cup milk with water instead. Alternatively, you could use almond milk, but I personally didn’t think the flavor mingled well together. 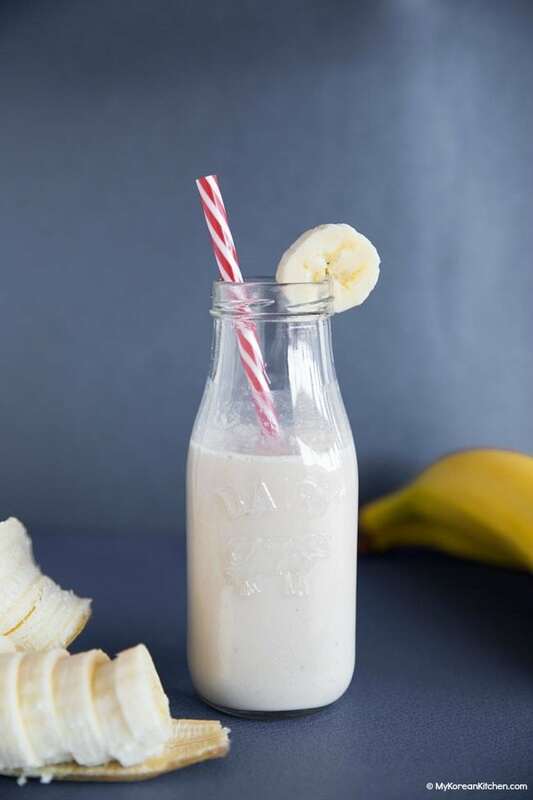 If you decide to omit the water and add more regular milk, you will end up with a banana smoothie. (A lot thicker texture.) I find that 1/2 milk and 1/2 water produces the sweet spot consistency. You can use honey instead of maple syrup, but I preferred the outcome with maple syrup more. I think it gives a more smooth texture and lighter sweet flavor. This was very yummy! It definitely reminded me of the boxed ones i used to drink as a kid. My 3yo absolutely enjoyed it too. Thank you for a great recipe! Hi, I would like to ask if I use a smaller banana should I use more banana? 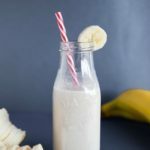 I’ve been looking for banana milk in my area for so long, but this recipe was my saving grace. It’s so delicious! Hello! 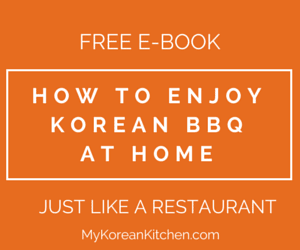 I plan to make your recipe for this as well as your Korean Street Toast one too. 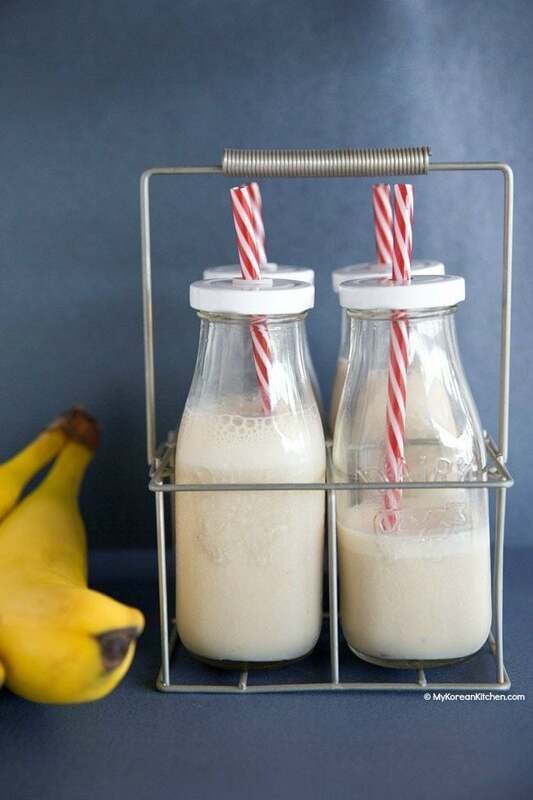 My question is if I make a larger batch of this banana milk can I store it or will it have to be used that day? Thank you! I am so excited to try these and more. I plan to explore your site and see what other gems I find. Specifically I am looking for jajangmyeon. Fingers crossed! Thanks again for the tasty sounding recipes! Also, my jajangmyeon recipe is here. https://mykoreankitchen.com/korean-black-bean-sauce-noodles-jajangmyeon/ Enjoy! Yum! Just made this this morning! Light, sweet, and refreshing. And so easy! Hope your family likes it! I made this as the recipe was wrote, but I found that I didn’t really like it. I think it would have been better if it used heavy cream over milk and water. I know that wouldn’t make it healthy like most recipes are directed toward how they grew up on. l’m in the US and so I lean toward something that isn’t really good for you. It was very easy to make and they loved it! This banana milk sounds super delicious! Thank you for posting the recipe! Hy Sue, It looks so yummy and tasty. Actually, I used to drink Banana milkshake I love that. This will help me to tasty in the different style.Thanks for sharing this. This is so good! Thanks for the recipes! Thank you for this yummy, easy recipe! I used lactose-free milk and love that I can drink this and not feel sick. I like the store-bought version too but this is awesome! 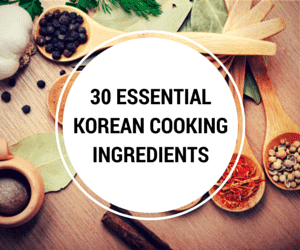 How would i make Kimchi in a country where I cant get Korean food. What spices would i need to add. Our country also gets very hot, about 35 in summer. Hi Michele, I answered your question in this post. https://mykoreankitchen.com/fresh-napa-cabbage-kimchi-salad-baechu-geotjeori/ Hope this helps! Keep up with the yummy recipes please!! Thank you! !